Give yourself space: you can’t give your home a good clean without moving the furniture out of the way. Move your furniture to the middle of the room so you can do a quick vacuum/sweep/dust. Check the ceiling: get up high and dust ceiling fans and lights, the spots that get neglected most of the year. This will fight off allergens too. Walls: you’d be surprised how dirty your walls can get, give them a good wipe. It’s not a bad idea to repair cracks or chipped paint on walls as well. Windows: get your windows sparkling clean, inside and out. Refresh your bed: flip your mattress and consider refreshing your linens. Baseboards: this is usually one of the most neglected places for cleaning, but you’ll find once you get to it that this where a lot of dust and grime hides. High dusting: get a ladder and dust those places that don’t get dusted as often: top of your refrigerator, book shelves, etc. Behind appliances: this is probably a spot you haven’t even thought of yet, but just think of all that’s hiding behind your oven, fridge, etc. 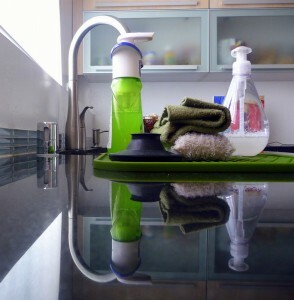 Cabinets: when was the last time you took out all your dishes and gave your cabinets a good cleaning? This is a perfect time to get that task done. Closet: make space for your spring/summer clothes by boxing away your winter clothing. You could also get rid of any clothing you don’t want anymore and donate it to charity. Do you donate items after spring cleaning to a local charity or organization? We’d love to hear about who it is, please get in touch on Twitter.